It may be the smoothest quiche I’ve ever had. Richard Beaven had just shown me around Little Ghent Farm while his wife, Mimi, prepared to make paté for the farm store, which opens Thursday to Sunday each week — when I joined her in the kitchen, she told me she had plans for peach ice cream too. On a blazing Thursday afternoon, as we wound up a long and friendly conversation, he gave me a recommendation for lunch on the way home. Ghent, a village along New York county route 22, has a small and scattered town center, a few businesses clustered around the post office. But Chatham, just up the road, has the kind of downtown that can take hours to explore, ambling around small businesses, reading plaques, taking in the suit of armor on the corner and the stuffed giraffe outside the bookstore. And it has a fair showing of restaurants. 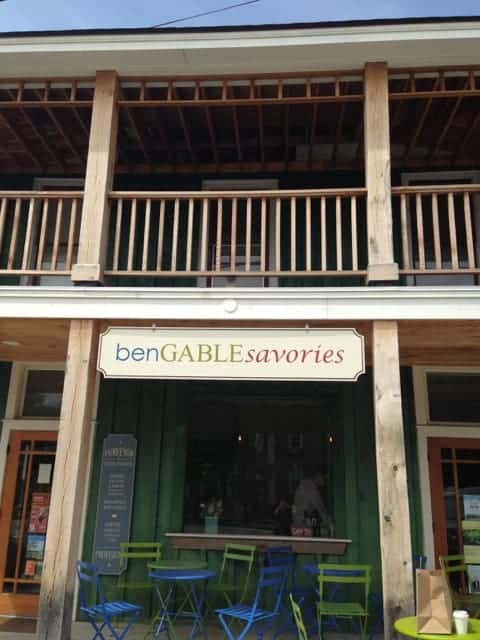 The Beavens directed me to Ben Gable Savories at 17 Central Square, and I found it a short walk past the cheese shop and the bookstore, right on Route 66. 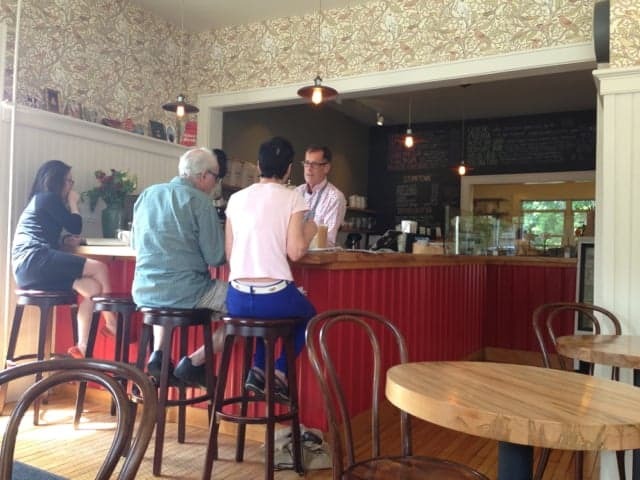 It’s a coffee shop and cafe, a comfortable place for soup and sandwiches and coffee. And the coffee caught my eye right off — they serve Stumptown, the kind my sister and her husband fell for when they lived in Brooklyn. They would love this place. The cream is real cream, not half-and-half, and it comes from a local dairy. Many of the ingredients come from local farms as well, eggs from Feather Ridge, milk from High Lawn Farm in Lee. The quiche I order, ham and gruyere, comes in a flaky, rich crust that looks and feels handmade and gently rolled out with a rolling pin. The egg custard is soft and set, the ham cut small, flavorful and abundant, and the cheese present without overwhelming. It’s beautifully balanced. I sit quietly, savoring each taste, as I feel the cook must have enjoyed taking time over the making of it. It comes with a green salad, mixed young greens deftly and lightly dressed. People talk quietly at the counter, and the man attending to them comes over presently to ask if I would like anything more — helpful, responsive and subtle. I feel comfortable here, and I would come a long way to taste this quiche again.